WHEN Richard Walker posted his now famous letter to “BB”, in January 1947, its recipient would not have guessed that he was receiving correspondence from England’s most accomplished carp catcher. This said, in an age when Albert Buckley was still regarded as England’s greatest ever carp fisherman, BB still thought highly enough of Walker’s letter to include it as one chapter, in "Confessions of a Carp Fisher". The rest, as they say, is history; but it could have been all so different. Little more than five years before Walker set the angling world alight with the capture of “Clarissa” he was confessing to BB that his experience of double-figure fish was limited to just one, rather tiny pool which was located – conveniently enough - close to his home. Walker, at the time, was a non-driver and his target, to all intents and purposes, had to be Bearton Pond, in Hitchin: a half acre puddle that still exists, and which is now very private. However, it was a pool that gave at least one remarkable fisherman, Richard Walker, the confidence to develop techniques that would soon be the talk of the angling world. And Walker invited BB down to fish it and achieve his long-standing ambition of landing a “double”: an ambition that BB was to achieve at long last, on the littered banks of Bearton Pond. But the author of “Confessions of a Carp Fisher” must have wondered what he had got himself into, having already seen and appreciated the lonely, isolated beauties of scenic waters like Beechmere. In the Fifth British Carp Study Group Book, BB had some interesting things to say about his first encounter with Walker. In fact, as the carp fishing historian Kevin Clifford points out, in “A History of Carp Fishing Revisited”, Walker’s home water of Bearton Pond was and is little more than half an acre in extent. Walker had actually doubled its size in his letter to BB. Against these somewhat startling facts, we must set this statement by Barrie Rickards that “before the formation of the CCC (Carp Catchers’ Club), before the 1950s, he (Walker) was an exceptional carp angler...” (reference: Richard Walker, Biography of and Angling Legend, Medlar Press, 2007). The two accounts seem very hard to reconcile, and it is hard to see how Walker was able to rise so quickly to carp fishing prominence even by 1951, when he was yet to land a twenty pounder. This was unlike a number of highly successful pioneers, at Dagenham in particular, including Harry Grief. But it was the sheer quantity of doubles landed by Walker that made him something special, because his achievement was probably unparalleled at the time. How many doubles had Walker caught by then? If Walker had perished during World War Two, his record would still have been commendable, even unique for the period, and for many decades afterwards. Other doubles would come from Temple Pool (Hexton Manor) and from Woldale, and Walker would finally catch his first twenty, a common from Dagenham, in August 1952. 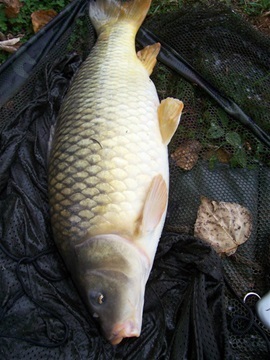 By the time Clarissa came to the net, Walker had caught well over seventy doubles; but many of those, as we have seen, came from Bearton Pond, and most of those fell to floating crust in very weedy and difficult conditions. Yes, there must have been many repeat captures in such a small pond, but his achievement is still considerable, and the hours he spent on the banks of Bearton Pond laid the foundations for modern carp fishing as we know it. Different times and different values. Yes, they asked permission from McClean to remove fish. He had a very long common at Redmire - and yes, that had to be a Leney. It could have been nothing else. I always understood that redmire was stocked with 50 mirrors at a cost of two pounds and seventeen shillings !!!! There was only mirrors I am sure !!! It does not matter if its true ,we all moved fish about before , and he done alot for the sport , but he was no angel like everyone thinks!!! !